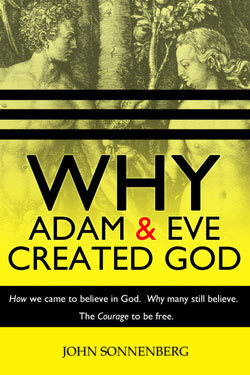 About "Why Adam and Eve Created God" - The book that will change your life. If you are a believer, this book will be a real eye-opener, yet sensitive to your belief system. It is a comprehensive resource that for the first time pieces together the social, historical, emotional, psychological, logical, and scientific reasons why you believe in one version of one of the 4000+ religions. The journey through this book will fascinate you by showing why your experiences and religious convictions are not unique. Believers in all faiths around the world have a lot in common. By understanding why others believe in their God, you will come to see that your faith is as deep, reasonable, well-rounded, and normal as every other religion on earth. When you understand why we believe God created humans, you will know with certainty that we created God. Belief in God is normal. In this book you will see why normal intelligent people believe in God. But, there are no supernatural reasons to believe. Experts in fields of psychology, sociology, history, and science have figured out what makes people believers, and this book pulls their research together in a comprehensive way that has never been done before. The reason you believe in God is the result of countless influences on your life beginning at birth, and you continue to believe for numerous historical, social, psychological, logical, philosophic, and emotional reasons. Read this book to clearly understand why you believe in God. And you will feel so much better about the emotions surrounding your faith. You will then have the courage to deal with them, your faith, and all the other believers in your life. And I hope, you will have the nerve to embrace religious freedom. The time has come to treat religion and belief in God honestly and fairly. Honestly by ensuring men, women, and children are well-educated about religious beliefs. This sounds reasonable, but it is illegal to do in schools, business, and government offices in most of the United States. Treating the believer fairly is important, for why they believe is no fault of their own. There are dozens of very good reasons that they do believe. But this is the challenge — most religious believers do not really know why they believe. The real reasons are surprising and not one is supernatural. I’m a research expert, designer, and developed this book as a series of steps to lead the reader down an enlightening path. It starts with a substantial amount of world history, because that is the where the foundation of most faiths lay. I highlight interesting facts about religious evolution that believers may be unaware of. Midway through the book it switches to discussing the hundreds of social, scientific, philosophic, economic, emotional, mental, and psychological reasons people believe. These too are often surprising and entertaining. By the last third of the book I directly confront the all the major religious arguments the believer is taught, relating them back to the first two sections. It can be provocative because it debases core beliefs. But the facts illustrate how core beliefs are very well refined ideas, what they are based on, and where they are simply misguided. Nothing personal. By the end of the book, you will find no religious argument left standing, feels good about what you learned, and have the confidence to take the leap away from faith.